Soudpur, government quarter, Block-L, Flat No. 7. 1. Name of the Society shall be: SODEPUR SREEJONI WELFARE SOCIETIES. 2. The Registered Office of the Society shall be situated at: C/59, D.N. Mukherjee Road, Amarabali, P.O. Sodepur, P.S. Kharda, Kolkata -10.
a. To acquire, establish, start, and run, maintain or manage primary schools, musical institution, libraries and publication of periodical magazine and books for the benefit of the people. b. To acquire established start and run, maintain or manage Library, Charitable Hospital, charitable dispensary, old age home, Orphan Home without Profit motive. c. To arrange and organize Music Teaching Institution, Upliftment of Music for needy students. d. To generate awareness and take initiatives on reproductive Child Health, Mother and Child Care, AIDS, General Health and Hygiene, Public Health among the poor people of all communities. f. To undertake and conduct music education, training in different therapy (Mind Cultivation and Health) for needy people of the Society. g. To arrange and organize lectures, debates, discussions, seminars workshop, exhibitions excursions of diffusion of knowledge and creating public opinion on health, education, human rights and environment issues. h. To organize an ambulance for the rendering service to the needy patients and to organize blood donation camp from time to time. i. To cultivate the spirit of culture among the people by organizing various cultural programs/functions from time to time. j. To make the unemployed self dependent through telefilm and serial for the welfare society. k. To arrange and organize various programme music and talent search test etc. l. To take over the management supervision and control of the part of the music institution being managed by the society. m. To provide home, education and health facility to destitute needy, less privileged and orphan children without discrimination of race, nationality, caste or creed and to arrange short stay home. In 1981, he passed from Sodepur High School. He passed from Bhoirab ganguly college, commerce in 1985. His father is Late Mr. Sachindra nath dewanjee and his mother is Late Ms. Pronoti Dewanjee. For music performance , he travelled Shilchor, Guwahati, Orissa. He worked at India Foils as Accounts Supervisor. Total music experience is 37 years. Started the training of music in early ages under the auspicious guidance of grandmother Srimati Pratibha Mukherjee , disciple of Kaji Najrul Islam and Pandit Girija Shankar Chakraborty. He had taken many lessons on classical music from Sri Paresh Dhar, Sri Jagannath Dhar, Pandit Subhas Mukherjee and Pandit Mohanlal Mishra. 1. Antara (Panihati) Hindustani classical music). 2. Utkarsha (sodepur) Bengali Modern song with Manna Dey. 3. Sangeet Samaj (Khardah) Hindustani classical music vocal with Ajay Chakraborty. 4. Kakali Bitan (Sodepur) Nazrul geeti, Raagpradhan. 5. All Bengal Music Competition , Rabindra Bharati Biswa Bidyalay (second position holder) in 1983. 6. Rama- Cassette album composed from reputed music recording company named Bhavna, where V. Balsara also published Cassettes and CD. 7. 1992-94 –Played flute in Radio as a casual player. 7. New Bengali Modern song. 8. Remake Bengali Modern song. Address: Block L, Flat 7, P.O. Sodepur, Kolkata- 700110. Telephone No. : 033-5834908, 9831181448. Invited by Goodwill Welfare Association (NGO at Uttarpara, Hoogly, 19th January Sunday, 1 pm, Judge of Najrulgeeti in a competition at this organization. Invited by The Municipal Commissioners of Panihati as Judge of Folk Songs competition on 17th, 18th, and 19th December 1999 on the Birth Anniversary of Kaji Nazrul Islam (12 noon) at Lokosanskriti Bhavan. Angles Nagar Recreation Club invited Mr. Trinesh Dewanjee on 07 .02. 99 as judge of a music competition. Recently the 14th annual function of Kakali Bitan Sangeet Bidyalay at Lokosanskriti Bhavan of Sodepur. The inaugural song was presented by Mr. Deborshi Chakraborty. Rabindrasageet was performed by Ms. Mr. Anurupa Kar, Mr. Parthasarathi Bhaumik, Ms. Mausumi Bhattacharya. Nazrulgeeti was performed by Ms. Susmita Ganachaudhury, Ms. Sudipta Ganachaudhury, Ms. Ellora Bandyopadhyay. Modern songs were presented by Ms. Dipankar Sharma and Ms. Anusuya Guhathakurata. 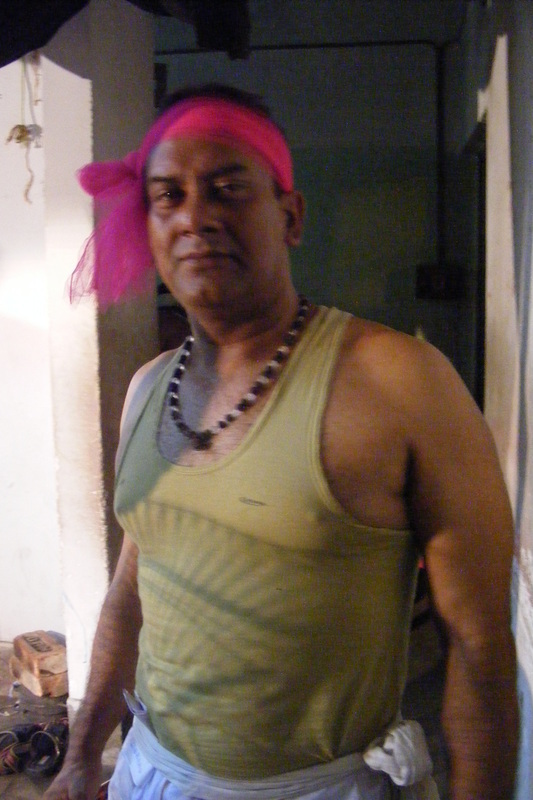 The notable attraction is the musical performance of Mr. Trinesh Dewanjee (Neelkantha) in lyrics and music. Inspite of a good arrangement by the organizers, the poor attendance of the audience proved that the popularity of the Rabindra- Najrul evening is dyeing out. Three days cultural program on classical music on Shastriya Sangeet Ashor every evening at 6 pm on 25th, 26th, and 27th July 1998 at Panihati Lokosanskriti Bhavan. The program presented by Antara (members of Panihati bhavan). Mr. Trinesh Dewanjee performed Kheyal along with other singers like Mr. Sandip Sengupta (kheyal), Ms. Gopa Chakraborty (Kheyal), Mr. Partha Sarkar, Mr. Bulbul Chakraborty (Thumri), Mr. Amulya Mohan Chattopadhyay (Kheyal), Mr. Uday Bandyopadhyay (Raag Pradhan), Mr. Bhaskar Chaklanabish (Kheyal), Mr. Sukanta Mukhopadhyay (Kheyal), Mr. Asish Chakraborty (Kheyal). In musical instruments, the performers were Mr. Suptasree Mukhopadhyay ( Sitar), Mr. Pradip Chattapadhyay (Sitar), Ms. Saswati Bhattacharya (Sitar), Mr. Subha Chakraborty, Mr. Sumit Kumar Banerjee (guitar). The table players in this program were Mr. Kamal Chatterjee, Mr. Madhusudhan Dutta, Mr. Kajal Guha, Mr. Subhashish Ray, Mr. Sabyasachi Chattopadhyay, Mr. Shiladitya Ghosh, Mr. Parimal Mukhopadhyay, Mr. Kamal Chatterjee, Mr. Pulak Bhattacharya, Mr. Tarun Majumdar, Mr. Amitava Mitra, Mr. Subhas Kanti Das who played with the Kheyal song of Mr. Trinesh Dewanjee, Mr. Sanjeev Chakraborty who played with Mr. Dewanjee’s Kheyal song. Panihati Music Circle-In memory of Pandit Samta Prasad – 1st year classical music meeting—March 5, Sunday 3 pm at Sodepur Lokosanskriti Bhavan. 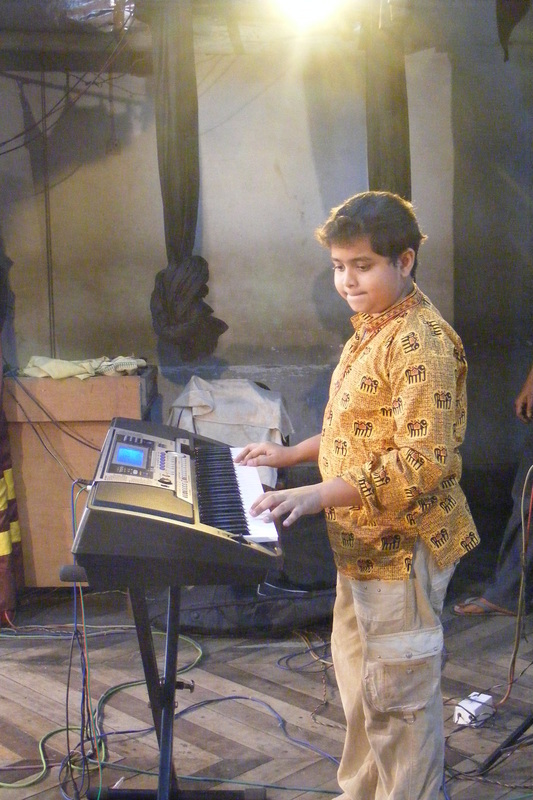 Mr. Dewanjee played Harmonium at this program along with Mr. Partha Pratim. In this program , the other participants were Mr. Ramlal Mishra (Sarengi), Tabla players (Mr. Sashanka Sekhar Bakshi, Mr. Biswajit Pal, Mr. Tarun Mazumdar, Mr. Kajal Guha, Mr. Subhas Kanti Das, Sarod (Mr. Kamal Mallick), Ustad Nasim Ahmed Khan (vocal), Srimati Nanda Banerjee (from America ) (vocal), Sri Subhas Mukherjee (President’s award winner) and Sri Partha Sarkar (chorus), Mr. Partha Pratim (Harmonium solo ). Utkarsha invited Mr. Trinesh Dewanjee to sing along with Mr. Manna Dey on May 4, 2000 at Sukanta Sadan, Barackpore. The general secretary was Supriya Dutta and President was Mr. Biplab Dutta. The reputed personalities who were present on that cultural program were Sarbasri Tarit Tapadar (parliamentarian), Mr. Parveen Kumar (district police superintendent), Mr. Piyush Pandey (Barackpore police superintendent), Mr. Nirmal Ghosh (Councillor), Mr. Krishna Mohan (Music composer), Mr. Amit Bandhu Ghosh (Musician). The personalities felicited in the program were Sarbasree Pandit Mohanlal Mishra, Mr Sukhbilash Barma (I.A.S. ), Mr. Narayan Chandra Ghosh (I.P.S. ), Mr. Bhagirath Mishra (W.B.C. S.), Mr. Ashish Chakraborty (W. B. C. S.), Mr. Arjun Prasun Bandyopadhyay (Social Worker). 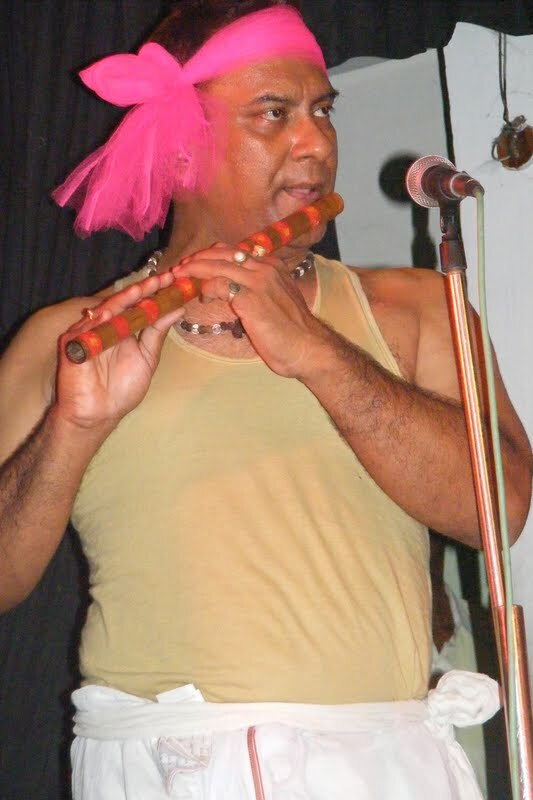 Khardaha Sangeet Samaj: Mr. Trinesh Dewanjee played flute at 64 Bosepara Road, Khardaha, north 24 parganas. 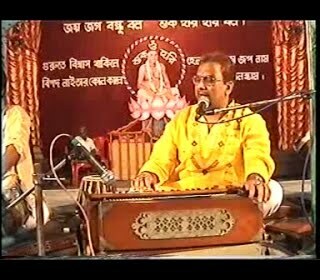 He was accompanied in Tabla by Sri Subhas Sinha Roy. The other instruments players were Sri Nilotpal Chakraborty accompanied in Tabla by Sri Shankar Ganguly, vocal recital by Sri Bimalendu Ghosh who was accompanied in tabla by Mr. Balaram Bhattacharya. This performance was given at Charubala Primary school in Khardaha on 9th September 1990 at 6:30 p.m.
Mr. Trinesh Dewanjee was the organizing secretary of Bharatiya Sanskriti Sangha, West Bengal (established on 12th January 1986, located at 34 Barabagan lane, Kolkata -700035). He was also the organization’s Editor. In this organization, reputed musician and literary personalities are present. They are Mr. Sanjib Chattopadhyay ( eminent literatteur), Mr. Ruby Mitra (Sur Bharati, Sangeet Bharati), Ms. Chabi Mukhopadhyay (reciter and dance teacher), vocal artists like Mr. Dilip Lodh, Mr. Gautam Basak, Dr. Dhyanesh Narayan Chakraborty MA, PHD Shastri Bachaspati, Ms. Mala Dey (M. Mus. Music artist). Mr. Dewanjee was the judge in Flute at Chatra Juba Utsav in a state level competition in flute. The event took place from 12th to 15th December, 1994. This West Bengal Chatra Yuba Utsav 1994 took place at Jorasanko on 13th December at 12 noon. The organization Rajya Yuba Kendra is at Moulali, Kolkata -14. On 18th March 1997 Tuesday at 6 pm,. Mr. Dewanjee played harmonium while Mr. Mukhopadhyay sang Bhajan and Kheyal and Mr. Subhas Kanti Das played Amulya Mohan the table as accompaniment. 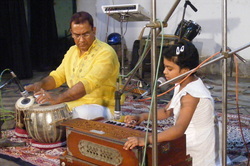 Tabla Lahara was performed by Mr. Parimal Mukhopadhyay. Mr. Uday Bandyopadhyay sang songs of Pandit Gyanprakash Ghosh and also sang Raagpradhan songs, and was accompanied in table by Mr. Sabyasachi Chattopadhyay. Mr. Indrajit Bandyopadhyay played Sitar and was accompanied in Tabla by Mr. Mihir Kundu. Madhyam (Classical music evening): March 14, 1999, Sunday, Panihati Lokosanskriti Bhavan , 3rd annual ceremony. Mr. Trinesh Dewanjee sang Raagpradhan songs here and the musicians in accompaniment with him are Sri Prabir Chatterjee, Sri Biswajit Biswas, Sri Niranjan Das, Sri Partha Dutta, Sri Arup Chatterjee, Sri Krishnapada Sinharoy. Vocal by Mr. Sanjay Bhattacharya. Sarod was performed by Ms. Sudeshna Bhattacharya. Anchoring by Ms. Anjana Banerjee. This program took place at Gouranga Bidyalay, Sodepur, North 24 parganas. Musical program for the relief of Gujarat’s terrible earthquake organized by Panihati Bangla Sangeet Chetana Samiti, South 24 parganas. Mr. Trinesh Dewanjee participated in the cultural program along with others like Ms. Sanghamitra Banerjee, Ms. Debika Mukherjee, Ms. Nimu Bhaumick, Mr. Bhaskar Banerjee, Ms. Sreela Majumdar, Mr. Kunal Dutta , Mr. Shibram Karmakar, Mr. Raju Ray, Ms. Shatarupa Das, Ms. Molly Bhaumick, Mr. Utpal Dey, Mr. Sanjay Banerjee, Mr. Aditya Subhagata Chanda, Mr. Bob Chakraborty, Mr. Narayan Chakraborty, Ms. Shanta Das, Master Pintu. This program was held on February 26. 2001 at Panihati Lokosanskriti Bhavan. Bhabapagla Sadhana Sangeet Maha Sammelan organized a cultural program on 4th, 5th and 6th February 2005 where Mr. Trinesh Dewanjee participated as a singer. The program was held at NCAC ground, Nonachandanpur, Barackpore. Mohini Sangeet Chakra , a classical musical evening, held at Sodepur High School, Hall, North 24 parganas, on April 25, 1992 at 5:30 pm, Mr. Trinesh Dewanjee played Flute and the singers who participated in the program are Mr. Balaram Das, Ms. Ranjana Das, Mr. Partha Sarkar, Ms. Soma Pal and others. Nabin Pratibha organized a cultural program where Mr. Trinesh Dewanjee was invited as a guest in the program at Arabinda Pally, Natagarh, Sodepur in January 31, 2001. Cultural program organized by Bankura zilla Jatiyo Krira O Shakti Shangha on September 2, 1986 at 7 pm in Rabindrabhavan where Mr. Trinesh Dewanjee attended the program on Kach O Debjani, a Srutinatak by Mr. Jagannath Basu and Ms. Urmimala Basu was held and a song by Mr. Shibaji Chattopadhyay. Rhythm at Sreepur in Madhyamgram organized a cultural program on December 12, 1993 at Ramkrishna Sarani at Sodepur Road in Madhyamgram at 5 pm where Mr. Trinesh Dewanjee played Flute along with guitar player Mr. Amal Kar, Sitar player Mr. Partha Pal, tabla player Mr. Bimal Pal, kheyal singer Mr. Snehashish Chatterjee, kathak dance by Ms. Sangeeta Mukherjee, Bhajan and Raagpradhan songs by Ms. Sanghamitra Basu, duet table lahara by Mr. Subhendu Das and Mr. Kaushik Dutta. Prayas Sanskritic Sangathan, Kalyannagar, Khardah, North 24 pargana, 24th November 2005, seminar was organized and a ‘mahara’ and Mr. Trinesh Dewanjee was invited in this seminar by Mr. Sabyasachi Sanyal, Editor. Panihati Chenamukh Club located at Ramkrishna Ashram Road, P.O. Panihati in North 24 pargana Invited Mr. Trinesh Dewanjee in a cultural competition on Nazrul geeti, recitation and Rabindra Sangeet and drawing on 16, 17 and 24 November 1996. He was made the Judge of Nazrul Geeti to be held at 3 pm by Mr. Sudip Roy, Cultural Secretary of Panihati Chenamukh Club. Mr. Trinesh Dewanjee participated in the Panihati Pouro Chatra Yuva Utsab on 17th and 18th December 1998 for a World Free from Wars. He was made the Judge in the competition on Folk Songs by Mr. Monoranjan Sarkar, Chairman of Chatra Yuva Utsab Samiti and Councillor of Panihati Municipality. Dipanjan Ghosh: At Sukanta Sadan in Barackpore, a felicitation program was organized along with a musical program. In this cultural evening, Mr. Mohanlal Mitra, Mr. Manna Dey, Mr. Ashish Chakraborty, Mr. Sukhbilash Sharma, Mr. Narayan Chandra Ghosh, Mr. Bhagirath Maitra, and Mr. Arjun Prasun Bandyopadhyay. At the end of the felicitation program, musical performance was given by Ms. Rinku Biswas, Nilkantha (Mr. Trinesh Dewanjee ) and the students of Kakali Bitan. But the main attraction was the performance of Mr. Manna Dey. Mr. Manna Dey is tired due to his old age but he is the best as he has won the hearts of the audience. His songs like ‘Jadi Himalay Aaj Jadi’, ‘Aj Abar Sei Pathey,’ ‘Monay Porey Sei Din,’ ‘Sundari Go’, ‘E toh Rag Noi’, ‘Ei Kuley Aami,’ ‘Dur Hai Kinara’, etc. have won the hearts of the audience. He told the reporter of Sambad Akhon some of his favorite ideas. Manna Dey is a bright example of the musical world. He is not only successful as a musician but he is also a great personality. On May of this year, he has reached 80 years of age. Q: How do you accept the love of the audience in this way? Do you feel irritated? Manna Dey: Why will I get irritated, love is the main thing. It is through love by which we can conquer everything. Q: How do you feel performing in the age of the cable channels? Manna Dey: I do not find any difficulty. Good listeners want to get something and likes good songs. As long as I am physically fit, I will continue singing. Music is my life. We took this interview taking permission from the organizers and tried to present a small portion of it and in the future, we will publish a detailed interview. http://www.youtube.com/watch?v=AfGMxxMlJ6I&list=UUcSepBm29qL7C7FPDAeTivA&index=15&feature=plcp GROUP SONG HARE RE RE AMAY CHERE DE RE RE !!! WONDERFUL SONG BY CHILDREN!! song and dance wonderful !!! http://www.youtube.com/watch?v=pFkRYLLNudk&feature=relmfu kakali bitan sangeet vidyalay..